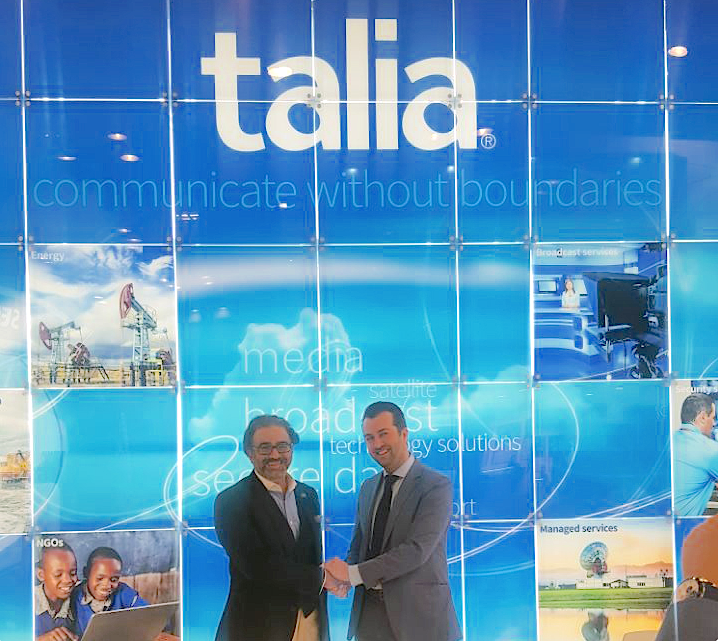 Good news and photos at CABSAT 2018 as all celebrate the strong partnership between Talia and Newtec that was further validated with Talia purchasing an additional Newtec Dialog® platform to provide Ka-band High Throughput Satellite (HTS) services to Afghanistan and Iraq. The additions will provide access to multiple transponders on Arabsat’s 5C Ka-band satellite, located at 20 Degrees East. Talia continues to operate VSAT and terrestrial services to the African and Middle Eastern regions. In these areas, Talia provides sales and support through local offices in Iraq and Afghanistan. The HTS Newtec Dialog platform uses small VSAT antennas to create a new lower price point for internet access in the region. This new lower price point for hardware and services greatly enhances the ability to get people connected to the internet – supporting Talia’s commitment to transform communities and economies as part of its corporate social responsibility program. Jack Buechler, Talia’s VP Business Development, said said that they are delighted with the performance, flexibility, manageability and reliability of the existing Newtec Dialog platform covering the whole of Africa. This new platform will service both broadband users utilizing low-cost, self-install 75cm antennae, as well as enterprise and carrier-grade services at much higher bandwidths. The Newtec Dialog platform uses setup guides so that customers can self-install the terminals with an app – either on Apple’s iPhone or Google’s Android devices. This ease-of-access and reduced upfront costwill allow more users to take-up these new Ka-band HTS services. Thomas Van den Driessche, Newtec’s CEO said that Talia is a longstanding partner of Newtec and has always been at the forefront of providing its customers with high-speed efficiency and reliability, and that the purchase of this latest Newtec Dialog platform will see their cooperation move into a multitude of new services and they applaud Talia on its innovative market approach. Newtec and Talia are at CABSAT 2018, and Newtec's booth is ZB1-B30 and Talia is at booth ZB1-B40.